Hit .279 with 11 doubles, two triples, three homers, 26 RBI, 12 walks and 16 runs scored in 53 games between Double-A Harrisburg and Triple-A Syracuse... Hit .200 (6-for-30) with one double and one RBI in 10 games for Toros del Este of the Dominican Winter League. Played in a career-high 101 games, setting career marks in nearly every offensive category...Ranked second on the club with 30 doubles...Following the season, was rated by Baseball America as the "Best Defensive Catcher" in the Carolina League...Entered the season rated as the No. 23 prospect in the system, per Baseball America and the No. 27 prospect, according to MLB.com. 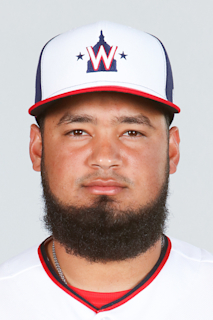 March 8, 2019 Washington Nationals optioned C Raudy Read to Fresno Grizzlies. December 20, 2018 Toros del Este placed C Raudy Read on the reserve list. October 1, 2018 Washington Nationals recalled C Raudy Read from Harrisburg Senators. July 12, 2018 C Raudy Read assigned to Harrisburg Senators from Syracuse Chiefs. June 30, 2018 Washington Nationals optioned C Raudy Read to Syracuse Chiefs. June 30, 2018 Washington Nationals reassigned C Raudy Read to the minor leagues. June 22, 2018 sent C Raudy Read on a rehab assignment to Syracuse Chiefs. June 15, 2018 sent C Raudy Read on a rehab assignment to Harrisburg Senators. February 7, 2018 Washington Nationals placed C Raudy Read on the restricted list. October 13, 2017 Washington Nationals activated C Raudy Read. September 1, 2017 Washington Nationals recalled C Raudy Read from Harrisburg Senators. March 13, 2017 Washington Nationals optioned C Raudy Read to Harrisburg Senators. November 18, 2016 Washington Nationals selected the contract of Raudy Read from Potomac Nationals. October 20, 2016 C Raudy Read assigned to Toros del Este. March 4, 2016 C Raudy Read assigned to Washington Nationals. September 1, 2015 C Raudy Read assigned to Potomac Nationals from Hagerstown Suns. July 3, 2015 Hagerstown Suns activated C Raudy Read from the temporarily inactive list. June 30, 2015 Hagerstown Suns placed C Raudy Read on the temporarily inactive list. June 11, 2015 Hagerstown Suns activated C Raudy Read from the 7-day disabled list. June 4, 2015 Hagerstown Suns placed C Raudy Read on the 7-day disabled list. May 25, 2015 Hagerstown Suns activated C Raudy Read from the 7-day disabled list. May 17, 2015 Hagerstown Suns placed C Raudy Read on the 7-day disabled list. April 7, 2015 C Raudy Read assigned to Hagerstown Suns from Auburn Doubledays. April 3, 2015 C Raudy Read assigned to Washington Nationals. June 10, 2014 C Raudy Read assigned to Auburn Doubledays from GCL Nationals. June 1, 2013 C Raudy Read assigned to GCL Nationals from DSL Nationals. February 24, 2011 Raudy Read assigned to DSL Nationals. January 24, 2011 Washington Nationals signed free agent C Raudy Read to a minor league contract.